First and foremost, I want to say thank you to Erin from Bitchin' Blonde for these pictures - isn't she handy with a camera? We took these shots outside St George's Hall during British Style Collective (have you read my British Style Collective review yet?) and I love how they turned out. 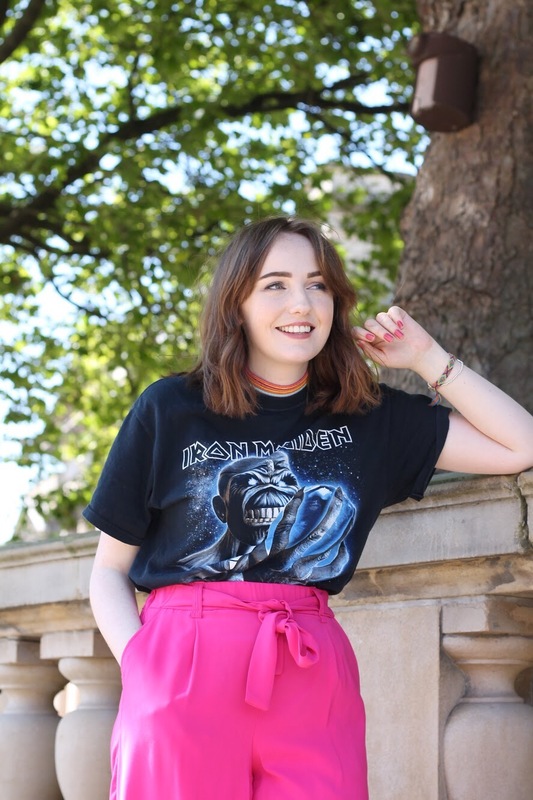 I wore this pretty colourful outfit for the third and final day of BSC 2017 and can honestly say it was one of my favourite outfits I've worn in ages. The night before, I was panicking about what to wear, trying to decide between these and a pair of gingham pants, but there's something about fuschia pink I'm just loving lately. 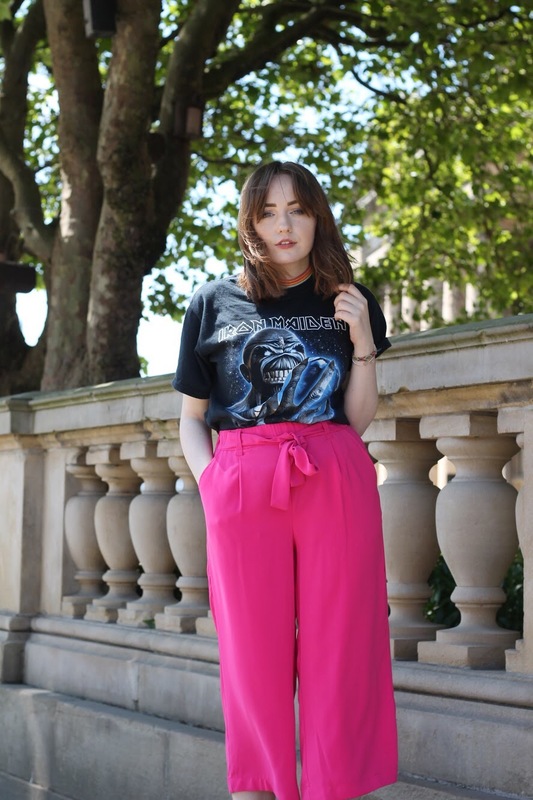 I picked up this bright pair of culottes in New Look last week and seeing as they made me feel pretty damn good, I thought I'd write a post on how to be confident wearing colour. 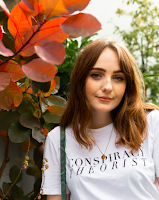 If you've been following my outfit blog posts for a while, you might know I stick to a fairly consistent colour palette of black, white, red and various shades of denim. Okay that sounds pretty colourful but all in all, I like black clothes. I always see a lot of insta babes rocking the rainbow look and wish I could look that colourful, but whenever I try, it just doesn't feel like me. Then on the other hand, when I wear head to toe black or denim, I can feel a little boring. That's why I've been trying to find a happy medium, and I think I've found that with this outfit. 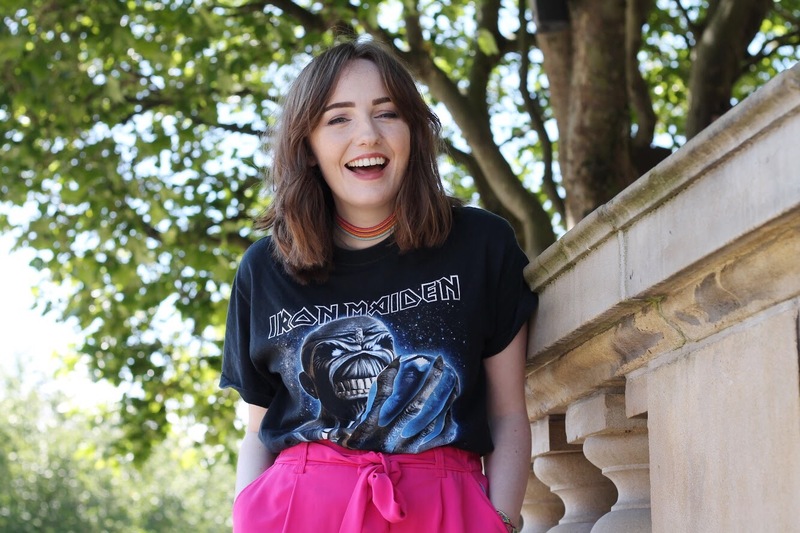 As I'm new to finding confidence through wearing colour, I'm certainly no expert, but my best advice if you're wondering how to be confident wearing colour, would be to find a happy medium in between where you are and your favourite colourful looks. So if this is your ideal but you're not quite there yet, try a bold accessory first, like a bright bag or pair of shoes. There are so many gorgeous statement shoes on the high street lately, I'm sure it wouldn't take too long. Then, once you're happy with that, add a little something else, working your way up to a bold piece such as these culottes. It comes as no surprise to anybody that I'm a fan of culottes. Granted, they might not always be the most flattering of cuts, but they're comfy, can be casual or dressy and just feel so damn good. I already have a black pair, a spotty pair, a striped pair, a pastel blue pair and now this bright pink pair, which cost me just £20. Not bad for a statement piece, right? 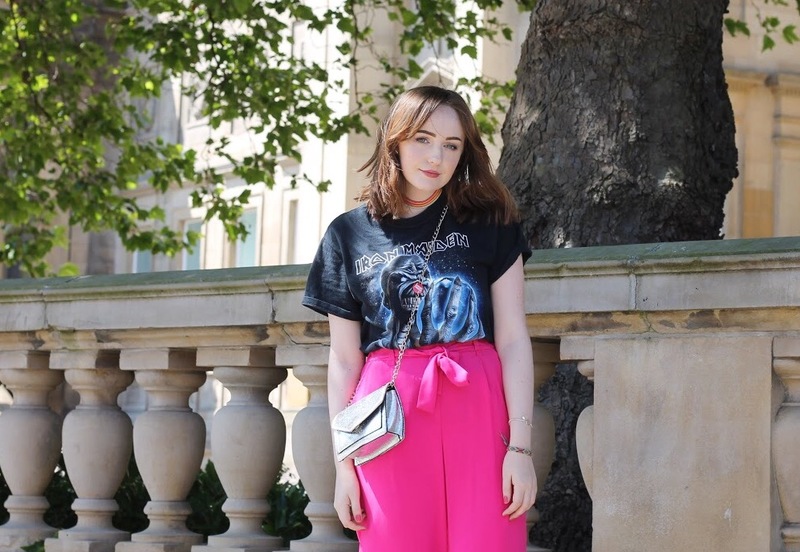 I mean, these culottes definitely made all the difference to this outfit. With a black pair, I'd have felt comfortable, but probably a bit 'in the background', especially surrounded by so many well dressed people that weekend. But the bright pink made me feel more than comfortable, I felt confident. I know these won't be to everybody's taste, but that doesn't matter. I'd rather be noticed than ignored. That's when a lightbulb went off in my head, and I realised the odd bit of colour makes me feel confident. I touched on this in my last outfit post, 'finding my favourite colours to wear', where I talked about my favourite colour of them all; beautiful bright red, and how sometimes I let that do the talking for me. That outfit was my favourite I've worn in ages, with this one coming a close second. So expect to see a bit more colour popping up on my Instagram as I try to find my confidence with colour. The colour of your New Look culottes is beautiful! 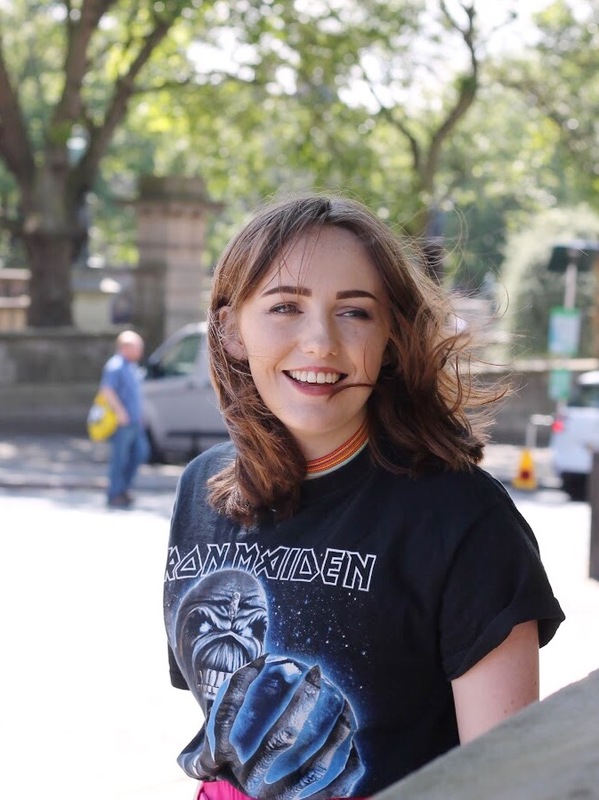 I love the Iron Maiden graphic T-shirt you styled with the outfit as well. Erin's outfit photos of you are great, and you look fabulous in all of them. You have a beautiful smile. 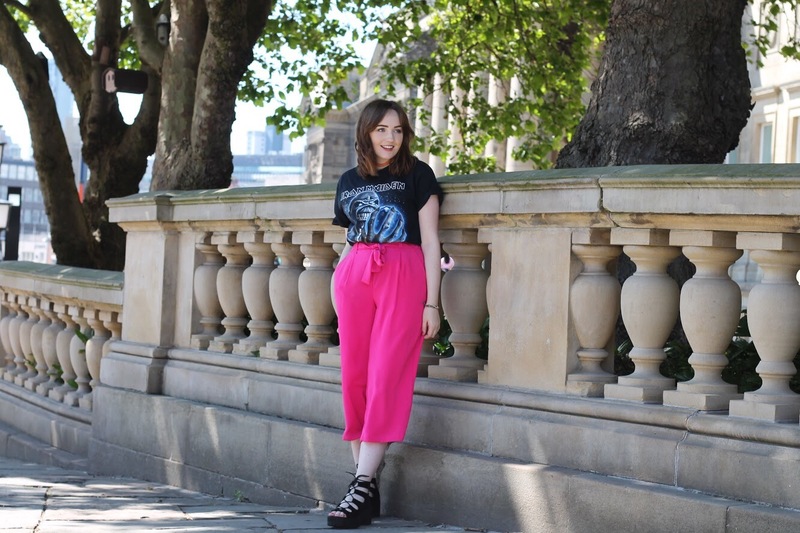 Love the culottes and how you've made them your own!